The WTO, the World Bank (WB), the International Monetary Fund (IMF) with their mysterious acronyms, their secret operations and unlimited power either terrorize or leave us indifferent: faced with these transnational forces, can we resist resignation? Tasty Talks – Do you know what you eat and who is eating the world? A meeting thought as introduction to the Peoples’ Summit. We exchange tastes and knowledge about agriculture and nutrition. Haitian economist and socio-political activist Camille Chalmers will offer a critical assessment of the current situation in Haiti, including the impacts and consequences of the so-called UN “stabilization” mission – MINUSTAH – which occupied Haiti between 2004 and October 2017 with troops from 12 Latin American countries, current perspectives of social movements and popular political forces, and the implications of the new UN mission “for Justice in Haiti”, the MINUJUSTH. We will discuss strategies of solidarity support in Argentina, the region and the world. Organised by: Argentine Committee of Solidarity for the end of the occupation of Haiti, Jubilee South/Americas, ALBA Movements. The Peoples’ Summit is part of the Global Week of Action against the World Trade Organization (WTO) which takes part from the 7th to the 13th of December in Buenos Aires, Argentina.1 It has been organized by a great number of organizations from different countries, backgrounds and struggles that got together to confront the destructive neoliberal agenda of the WTO by discussing and building collective forms of action to overcome the chains that hold us back. Location: Faculty of Social Sciences, University of Buenos Aires (UBA), Santiago del Estero 1029. A debate about the situation of workers in the face of capital’s brutal aggression. More specifically, the debate will examine the so-called labour reforms aimed at creating deep structural changes and leading to the destruction of workers’ rights obtained after more than a century of struggles, and other pressing issues. The Forum will work on the impact of neoliberalism on public health schemes and on access to health and medicines worldwide. The Forum and Feminist Assembly aims to open instances of training, debate and exchange of experiences that allow us to characterize the macroeconomic context of commodification and financialisation of nature, common goods, life and accumulation by spoliation in which we live in front of free trade. The Forum will be a space for organisations and people committed to or interested in various struggles against Free Trade, Debt and Corporate Power to meet and share. Discussion will focus on the main concerns in relation to these problems and their interrelation, the sharing of testimonies and information about struggles and campaigns in progress, the building of alternatives and action strategies. This forum will aim to analyse different models of extractivism associated with the capitalist development model, focusing on the current situation faced by the region and the world, especially considering the plundering of common goods and the planetary crisis of the Anthropocene period that has led humanity to an unprecedented climate crisis and confronts us with an inevitable civilizational change. The purpose of the forum is to analyse and debate both the onslaught of the mercantile and privatising logics in the educational field as well as the alternatives generated by various social actors. A debate with a global and regional perspective on the new forms taken by the world of work, the adequacy and setbacks of the rights promoted through Free Trade Agreements (FTAs) as well as the labour reforms in Latin American countries. Proposals from and challenges faced by social movements towards the ALBA against the advance of capital over our bodies and territories. The workshop reports on the occupation and colonisation of Palestine and its consequences. It also seeks to make visible and reflect on the purchase of weapons by different regional governments and about the repressive apparatuses of the state. 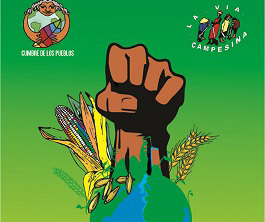 The Forum on Food Sovereignty will be an important moment of convergence between local, national and international movements that are building the necessary transformation of our production, distribution and agro-food consumption systems. We migrants question the neoliberal policies promoted by organisms like the WTO at a global level in recent years. We repudiate these policies which have generated increasing precariousness and underdevelopment in our countries, prioritising the interests of large transnational companies, ignoring our economic, political, social and cultural contribution in the countries of origin and destination. That’s why we say ¡WTO, out !!! This is a space for reflection and discussion on the most urgent and crucial aspects that our peoples and our Mother Earth are going through. There will be a national and international indigenous presence and it will constitute a true plurinational meeting. The aim of the forum is to analyse and unravel the contemporary imperialist phenomenon, specifically in its military action, which has produced and continues to produce so much devastation, destruction, genocide and pain throughout the world. The European Union is renegotiating the trade agreement signed with Mexico in 2000, although the agreement has deteriorated the economic and social situation in Mexico. This neoliberal policy also applies to other trade agreements currently negotiated, such as the agreement with MERCOSUR. The youth of the continent organise and stand against free trade. We are the future and we will defend it. What is left for us young people, in a world of increasing precariousness, unemployment, looting and hunger? What role do we play in struggles? How does an agenda of trade liberalisation agenda impact our present and our future? Panel – Debate “The social and popular economy: an alternative to the capitalist economy? The central axes of the debate will be the workers’ economy, the popular economy, self-management and spaces of democratic production. What is the G20; how does it work; what agenda is being proposed for 2018 and the multitude of meetings that will take place in Argentina in anticipation of the Summit of the twenty Heads of State; what points may be of special interest for our struggles; and most importantly, what are we planning to do about it? Intersecting views between Latin America and Europe, this workshop intends to open a space for reflection on the serious setbacks taking place in terms of guarantee of human rights as well as individual and collective freedoms, when a repressive response is deployed by the State, before this law. A Fair “WTO, out! Alternatives Exist” will take place throughout the alternative Summit of the Peoples and will allow producers of the Social and Solidarity Economy, agro-ecological producers, local trade networks, etc. to sell their products. In addition, the Independent and Alternative Book Fair – FLIA INFINITA will also be held from December 10 to 13 within the framework of the Week of Action against the WTO.